Products of the domain : Château de Malle. The history of the estate of Malle holds in one line: it belongs for five centuries to the same family. The castle itself was erected in the 17th century by Jacques de Malle, president of the parliament of Bordeaux. This jewel, classified historical monument, is visited, as well as its gardens. This small Italian masterpiece deserves to be considered for a long time, because for two centuries it has undergone no transformation, except the restorations indispensable to its preservation and use, since it is Inhabited by its owner who refrained from making it a museum. Fireplaces, decoration, furnishings, everything evokes an incomparable way of life. In 1855, the Château de Malle was awarded 2nd Cru of Sauterne. Henri de Lur-Saluces then owned the estate. Count Pierre de Bournazel, nephew of the late Marquis Bertrat de Lur-Saluces, owner of the Château Yquem, maintains the reputation of this second vintage after having revived the château and embellished it. Since his sudden death, at the end of 1985, his wife leads the property according to the principles established by her husband. The vineyard extends on an almost horizontal plane very slightly incised between 10 and 20 meters of altitude; It is composed of sand and fine clay-gravel lands sitting on a very acidic siliceous base. Following a catastrophic winter, the vineyard was completely replanted. The soil lacks humus, so it must be smoked. The vinification is done by grapes, grape varieties and plots. A horizontal press, finely driven for a slow pressing, avoids the excess of mud. Everything is done to eliminate the harmful effects of oxidation. Fermentations are carried out in barrels and vats. A stainless steel heat exchanger system allows transfers. Selections are made during racking. A first filtration on land takes place in the first winter while a second light filtration on low pressure cellulosic plates precedes the bottling. Before that, the wine will have aged in new barrels and in vats. All that is not retained during the selections is sold in regional appellation to the trade or bottled under the mark "Domaine de Sainte-Hélène". 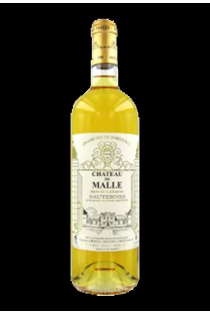 Sauternes - 2007 - Château de Malle.